The Argus, which is now celebrating its 150th year in print, has long been a haven for local advertisers—mostly Middletown restaurants and on-campus events. 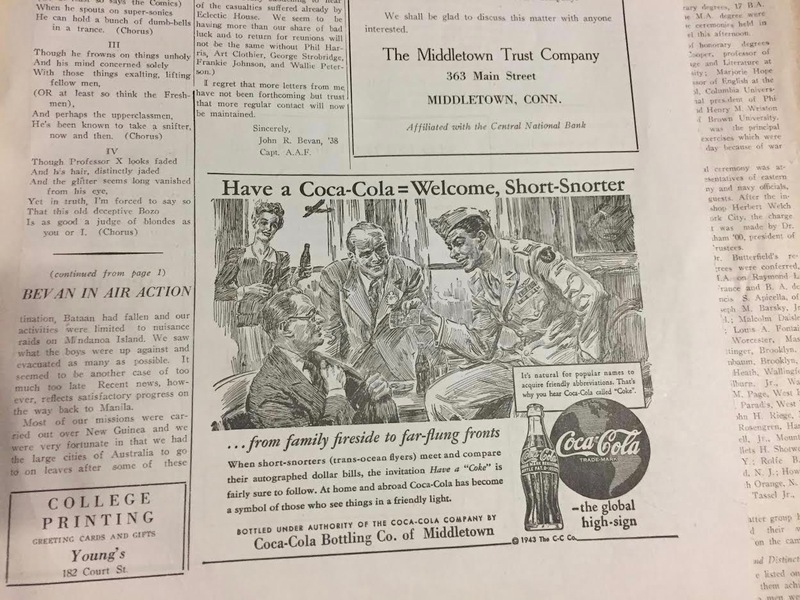 In decades past, however, we also housed ads from larger, national companies, such as Coca-Cola, Domino’s, and Brooks Brothers, which reflects the changing role of local newspaper advertising through the past century and a half. 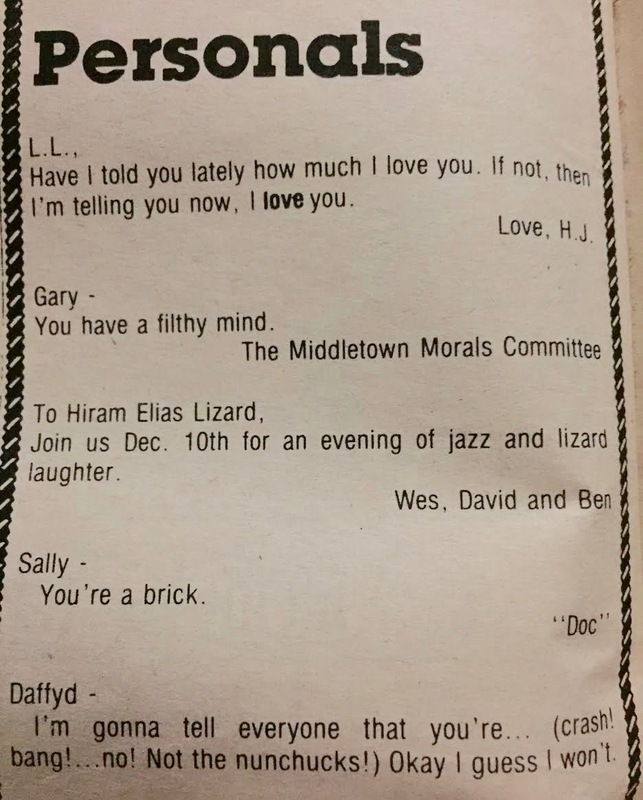 Apart from notices about on-campus events like Alpha Delt formals and concerts, which would nowadays be announced to the student body by means of an absurdist Facebook event and colorful posters, the pages of The Argus were also peppered with “F.Y.I.”s and personal ads. Students looking to buy or sell would include descriptions of the items in the paper, or just send sweet—or more often ridiculous—notes to friends on campus. These student submissions sadly disappeared during the 2008-2009 school year, but enjoyed a long tenure as a forum for classmates to publicly mock and flatter each other. Over the years, the ads’ target audience has changed with the student body’s makeup. 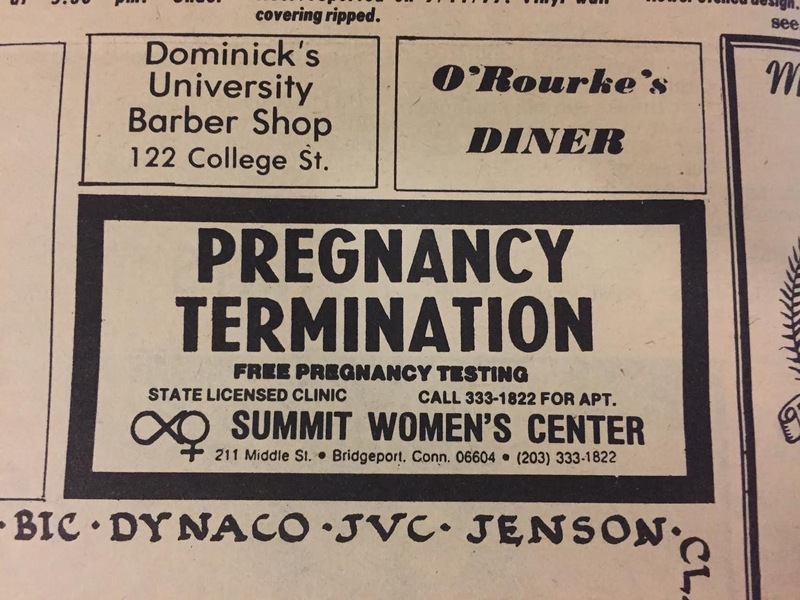 Ads for soldiers were commonplace in the early ’40s, and advertisers took aim at women when they rejoined the student body in 1969—including one bold ad four years after Roe v. Wade (1973) that appeals to those looking to terminate their pregnancies. 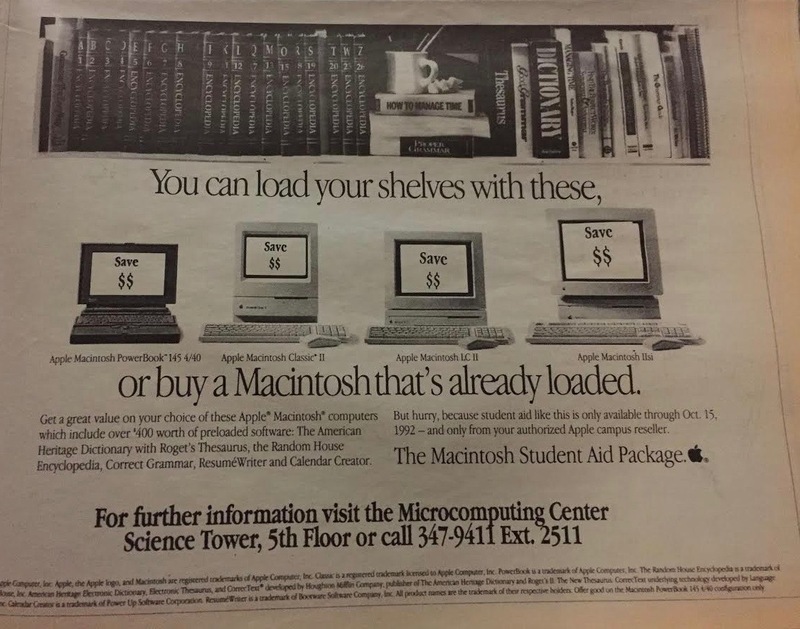 One 1932 ad sells Lucky Strike cigarettes, and one 1992 ad shows off Macintosh computers, reflecting an evolving tide of products, services, and locations that were appealing to the Wesleyan consumer. There was a significant decline in advertisements in the mid-to-late aughts—understandably, given more widespread usage of the internet. Mostly, the joy of going through decades of Argi is the glimpse at the campus and nation-wide history that is bound in the old records. 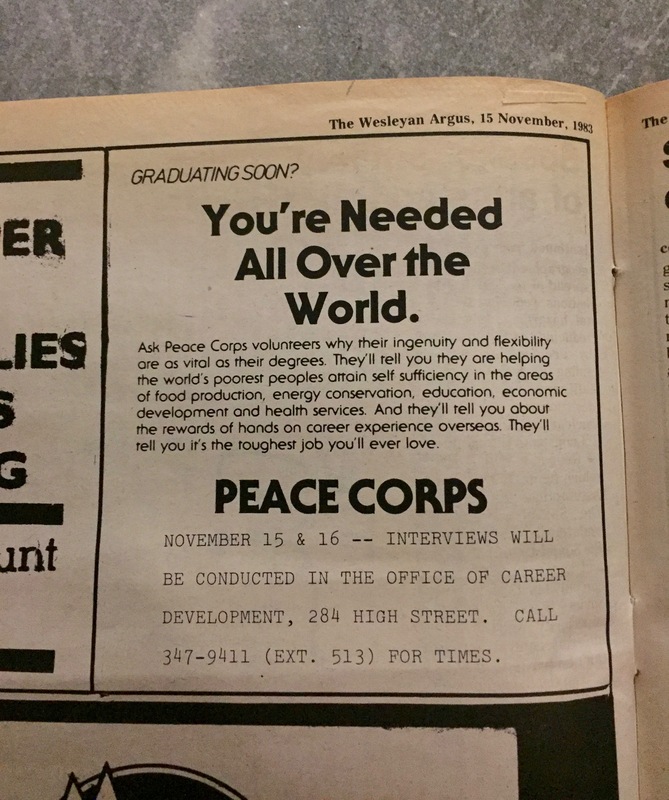 The Argus used to serve a much broader purpose, bringing the rest of the world to campus in its pages, both through advertisements and now-long-gone sections that address U.S. news or college campus news. 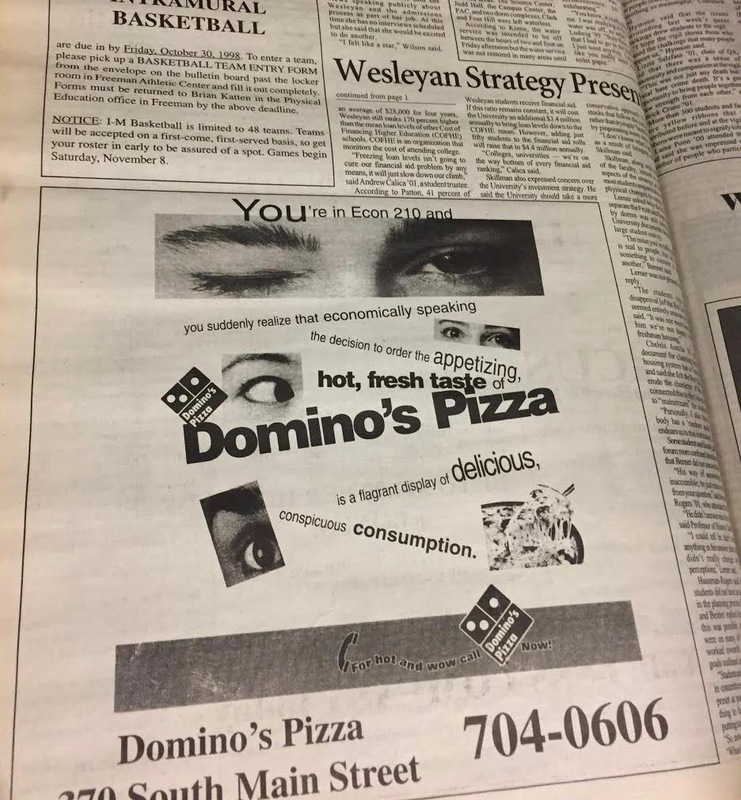 Now, we take a closer look at stories that are more directly related to the University, and our advertisements, which are now hyper-local, reflect that shift.